By attending to early growth patterns and intervening appropriately, the health community can help ensure better outcomes. Yet from the medical community to parent groups, initiating a discussion about infant or toddler weight can be considered almost taboo. Society, it seems, has a particular fondness for “plump” babies. Aside from the constant advertisements showing chubby, pink cherubs and Grandma’s comments about Mom and Dad needing to “fatten that baby up,” research conducted at Penn State University by Laraway and colleagues, published recently in Clinical Pediatrics, lends support to the theory that parents overwhelmingly perceive heavy babies as healthy babies. Their study also demonstrated that parents prefer infants who weigh in the highest quartile of the CDC growth charts. The most recent data available (2007 to 2008) from the National Health and Nutrition Examination Survey indicate a fairly high prevalence rate (approximately 9.5%) of obesity in infants from birth through the age of 2.2 As a result, the medical community is starting to pay more attention to this issue, despite not being advised to routinely screen children under the age of 6 by the most current U.S. Preventive Services Task Force recommendations for screening for obesity in children and adolescents.3 However, medical professionals have become more proactive in the last two years as a plethora of research on this controversial topic has been released, with several large-scale studies and meta-analyses published in the most prominent research journals. This study, published in the July 2010 issue of The Journal of Pediatrics, raises some critical questions regarding the prevention, screening, diagnosis, and treatment of infant obesity, a topic that, traditionally, many practitioners have been hesitant to engage. The title of the article, “Infant Obesity: Are We Ready to Make This Diagnosis?” captures the controversy and has sparked debate among researchers and parents alike. In fact, study after study verifies that although children often alter their growth patterns to achieve a healthy weight as they develop, many remain overweight or obese throughout childhood and into adolescence and adulthood if weight issues are not addressed. RDs mirror the hesitation seen in the larger medical community on this topic, noting that diagnosing obesity at such a young age is fraught with complications. “Though this is such a new area of research, what little information that is out there does suggest that infants who are obese at 6 months will be obese at 24 months, which we know is linked to long-term obesity in life if not treated. Therefore, I believe diagnosis is important at an early age, and educating parents is key. The word ‘obese’ has such a negative stigma. … Taking time to explain to parents the possible negative long-term health consequences of overfeeding and excess weight gain early on is key,” says Dana Vieselmeyer, MPH, RD, LD, chair of the American Dietetic Association’s (ADA) Pediatric Diabetes With Wellness and Weight Management Special Interest Group. Beverly Henry, PhD, RD, an associate professor of nutrition, dietetics, and hospitality administration at Northern Illinois University, seconds Steakley’s concern about diagnosing obesity so young. “I think it is more appropriate to evaluate feeding,” she says, stating that children often grow normally unless something gets in the way. Regardless of whether a true diagnosis of obesity is made, dietitians agree that pediatricians and medical professionals need to do more to monitor weight status during infancy and the toddler years and take necessary steps to alter growth patterns if appropriate. “The pediatrician has an opportunity to see the infant’s pattern of weight gain between 6 and 24 months and offer suggestions for slowing down the weight gain if appropriate,” Steakley says. Vieselmeyer adds that it is important to “pay close attention to weight trends in all infants being followed to avoid excess weight gain and possibly screen out ‘overweight’ and ‘obese’ infants for early intervention rather than just screening those 2 years of age and older,” as is routinely done. Regarding what the pediatric community can do, McCormick says, “We’ve gotten better. More practitioners are addressing this issue with parents and more parents are becoming interested in doing something about it, whereas previously you really were not seeing much of an effect. Instead, the goal should focus on slowing the rate of weight gain while simultaneously evaluating and improving feeding practices when possible. “Obviously, weight loss at such a young age is not recommended, but decreasing the rate of weight gain over time (to be determined based on current weight and goal weight percentile over time) is appropriate” notes Vieselmeyer. Nutrition interventions, therefore, should center on educating parents and caregivers of young children about appropriate feeding practices (including those that align with authoritative parenting) and the importance of allowing infants and toddlers to learn how to feed based on their own internal hunger cues. Focusing on weight, weight-for-length, or BMI in infants could lead parents to unnecessarily change feeding behaviors and could negatively impact their child’s eating patterns or distort their child’s expected growth pattern, Henry says. “If a parent responds to comments about [their child’s] growth by altering feeding composition, timing, or duration, those decisions may influence the infant's eating patterns and 'normal' consumption based on internal cues of hunger and satiety,” she says. McCormick notes three things in particular that can help fight infant obesity: increasing the number of women who breast-feed and for longer durations, introducing solids at an appropriate age (4 to 6 months) and not via the bottle (but by spoon) to help satiate while simultaneously decreasing liquid calories to account for solid foods, and limiting the volume of milk or formula and other calorie-containing beverages such as juice to age-appropriate portions. Weidenbenner and her colleagues in Ohio have been at the forefront of this effort, developing and implementing a public health initiative geared toward preventing childhood obesity from birth. Their program, An Ounce of Prevention Is Worth a Pound (see sidebar), provides physicians and healthcare providers with the necessary tools to monitor weight and provide anticipatory age-appropriate information about nutrition and physical activity when children are seen by their pediatrician, in a WIC clinic, in a Head Start program, or at some other healthcare appointment. “My dream has always been to expand the intense RD education and interventions provided in the WIC program to the entire population via physician offices, outreach clinics, private practices, etc. In my experience, every parent, regardless of income, needs this information because no one else is providing it. This is the main reason why the Ounce of Prevention Is Worth a Pound tool kit was developed,” notes Weidenbenner. • Sixty-four percent of physicians have increased the number of children for whom they calculate and plot the BMI percentile. 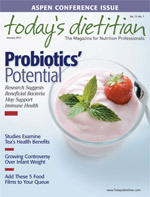 • Eighty percent of physicians have increased providing anticipatory information on nutrition to parents. • Eighty-one percent of physicians reported that parents were receptive to and interested in the physical activity and nutrition advice. • Eighty-two percent of physicians have increased providing anticipatory information on physical activity to parents. • Eighty-four percent of physicians reported that parents understood the tool kit messages. • Ninety-three percent of physicians reported that they would continue to use the tool kit. Additionally, the Ounce of Prevention initiative has been evaluated for prospective outcomes with the help of a National Institutes of Health grant; thus far, the study has evaluated more than 300 mothers and babies and has shown positive outcomes related to nutrition and physical activity indicators at both 6 and 12 months of age. The Ounce of Prevention tool kit (and other tools like it) can be a great starting point for collaboration between RDs and area physicians, especially given that roughly 20% to 25% of pediatricians report not feeling competent or comfortable enough to address issues of obesity with their patients9 and that most pediatricians also report feeling ineffective in their ability to treat obesity.10 “When [practitioners] provide specific nutrition and physical activity information, encourage and support breast-feeding, and discuss the infant’s growth chart with the caregiver, the information is taken seriously,” notes Weidenbenner. Regardless of how an RD chooses to view the diagnosis, infant obesity is a concern that is not going away. Strong evidence suggests it is unwise to ignore these early growth patterns, especially when these patterns are rooted in feeding practices that are likely to remain unchanged and subject a child to future weight problems and chronic health concerns. When considering nutrition interventions for this population, RDs should be at the forefront of preventive initiatives, working within their existing roles to counsel families with infants and toddlers on best practices related to feeding and forging new collaborations with pediatricians. — Christin L. Seher, MS, RD, LD, is founder of Strategic Health Solutions, LLC, serving northeastern Ohio. The Ounce of Prevention Is Worth a Pound tool kit is a preventive public health initiative developed via a collaboration among the Ohio Department of Health/Healthy Ohio; the American Academy of Pediatrics’ Ohio Chapter; Nationwide Children’s Hospital; the American Dairy Association Mideast; and the Ohio Dietetic Association. To access updated materials for children aged birth to 17 (in both English and Spanish) free of charge, visit http://healthyohioprogram.org/healthylife/nutri2/nutrikids2/ounce.aspx. 2. Ogden CL, Carroll MD, Curtin LR, Lamb MM, Flegal KM. Prevalence of high body mass index in US children and adolescents, 2007-2008. JAMA. 2010;303(3):242-249. 3. U.S. Preventive Services Task Force. Screening for obesity in children and adolescents: U.S. Preventive Services Task Force recommendation statement. Pediatrics. 2010;125(2):361-367. 4. McCormick DP, Sarpong K, Jordan L, Ray LA, Jain S. Infant obesity: Are we ready to make this diagnosis? J Pediatr. 2010;157(1):15-19. 5. Tavaras EM, Rifas-Shiman SI, Belfort MB, et al. Weight status in the first 6 months of life and obesity at 3 years of age. Pediatrics. 2009;123(4):1177-1183. 6. Tzoulaki I, Sovio U, Pillas D, et al. Relation of immediate postnatal growth with obesity and related metabolic risk factors in adulthood: the Northern Finland birth cohort 1966 study. Am J Epidemiol. 2010;171(9):989-998. 7. Nelson SM, Matthews P, Poston L. Maternal metabolism and obesity: Modifiable determinants of pregnancy outcome. Hum Reprod Updates. 2010;16(3):255-275. 8. Monasta L, Batty GD, Cattaneo A, et al. Early-life determinants of overweight and obesity: A review of systematic reviews. Obes Rev. 2010;11(10):695-708. 9. Jelalian E, Boergers J, Alday CS, Frank R. Survey of physician attitudes and practices related to pediatric obesity. Clin Pediatr. 2003;42(3):235-245. 10. Perrin EM, Flower KB, Garrett J, Ammerman AS. Preventing and treating obesity: Pediatricians’ self-efficacy, barriers, resources, and advocacy. Ambul Pediatr. 2005;5(3):150-156.